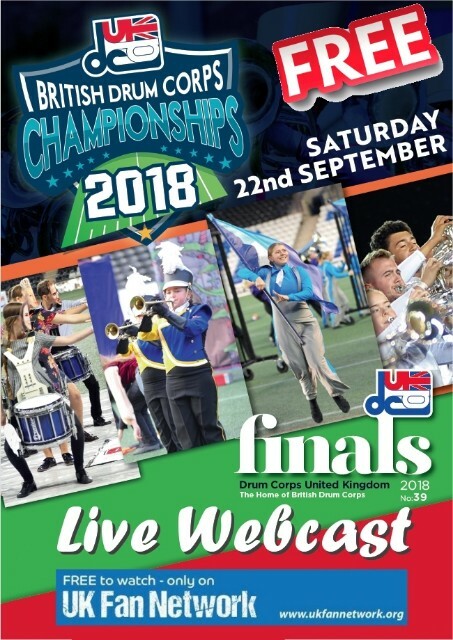 This Saturday, 22nd September, the DCUK 39th British Drum Corps Championships is taking place at the Select Security Halton Stadium in Widnes, Cheshire, England. On line ticket sales are still open until Thursday night – http://www.dcuk.org.uk/about/tickets.html – and then will be available at the venue from 10am Saturday. However, if you can’t make it to Widnes, then once again we will be providing a FREE webcast, sponsored by Absolute Embroidery & Printing, via our on line video portal – www.ukfannetwork.org. No subscription needed – the link to watch for FREE will be available on Saturday. Prelims commences at 1:30pm (UK) with the Finals contests (Junior Class, A Class and Open Class) commencing at 5.30pm (UK) plus during afternoon there will be a SoundSport contest and in the evening a DrumLine Battle and all will be available to watch via the webcast – and it’s FREE. Posted by News Editor on Wednesday, September 19th, 2018. Filed under Current News, Drum Corps U.K., FrontPage Feature.